Moina are small freshwater crustaceans, commonly called “water fleas”, belonging the Daphnia family. This common name is the result not only of their size, but their short, jerky, hopping movement in water. Many species of the freshwater family Daphniidae (order Cladocera) occur throughout the world and are collectively known as daphnia. The genera Moina are diverse and are a major food for both young and adult freshwater fish. 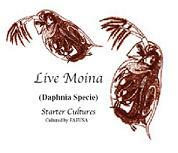 Literature abounds on the capture, biology, culture, and use of Daphnia sp., but little exists on Moina. Yet, within the Oriental countries, Moina is the number one live food for rearing freshwater tropical fish. Moina are often used as a Artemia substitute. Adult Moina (700- 1500 µm long) are larger than newly hatched brine shrimp (400-500 µm), and approximately 3 to 5 times the length of adult rotifers. Newly hatched Moina average 430 µm and are slightly larger than the smallest strain of newly hatched brine shrimp, and twice as large as adult rotifers. Common Daphnia are approximately twice the length of adult Moina and, as a result of their large size, are not suitable for the fry of many fish larvae. Moina are generally more tolerant of poor water quality than Daphnia. They live in water where the amount of dissolved oxygen varies from almost zero to supersaturation. Florida Aqua Farms is currently offering live cultures and will provide resting eggs in the future. 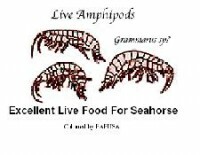 They can be easily cultured using the information in our Plankton Culture Manual.